We settled on a pitch in what the owners describe as 'the Valley.' We had to satisfy ourselves the van would cope with the narrow, bumpy lane that approached this more remote spot, totally devoid of other campers. Cleopatra made it with no problems and we spent longer debating our position on the plot taking into account being level and taking biggest advantage of the position of the sun. After that we spent an enjoyable afternoon and evening sitting between the cacti and surrounding terracotta mountains. It's such a rugged landscape and the wind was blowing a hoolie but it was as peaceful and relaxing as we could have hoped. A far cry from any of the other campsites along the coast situated next to nightclubs and the like. A feature of the campsite is its ecological credentials. It's off grid and the water comes from the family's own well and the electricity from solar. We were asked to try and use electricity during sunlight hours to avoid the generator having to kick in. To conserve energy we soaked the rice for the evening's paella during the afternoon and began cooking at about 5.30pm. Our evening meal and boiling a kettle for morning coffee was as taxing as our energy needs extended. A small communal outdoor kitchen featuring a gas hob and oven is an option for anyone looking to save on the six euro per night charge for solar electricity. The site also boasts a small swimming pool, not yet PH ready for the season during our stay. 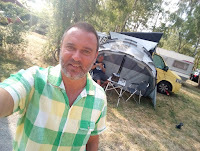 A volleyball and petanque court provide amusement for the sporty minded camper and an indoor games room will keep kids and adults entertained if required. There's a morning bread service and even eggs available from the family chickens. On our second day we decided to cycle to the beach. You can totally ignore Google Maps estimate of the time it will take to do this, particularly in the return direction. You can add at least an hour onto the minutes Google suggests. However, aside from crossing a busy road, the route is along quiet lanes, past olive groves and smallholdings. There's a lovely coastal path for hikes through the pine trees. We followed a family who were walking the path, our route on bike bringing us back out at the same spots intermittently. Eventually we found a nice little beach that we had all to ourselves. 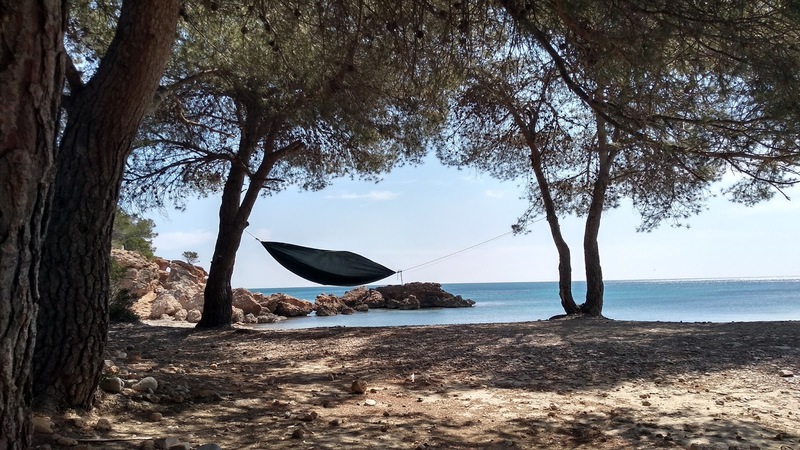 Tony laid down his beach mat while I hung my hammock between two pine trees. We paid 65 euros for two nights, including electricity. 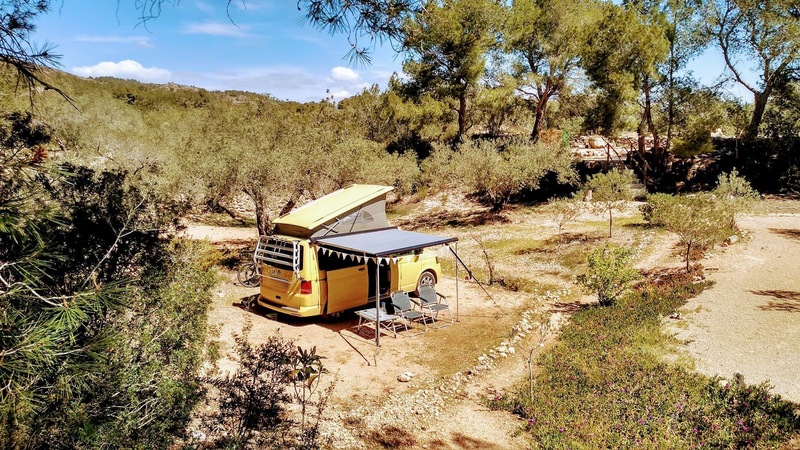 While there are cheaper campsites available, anyone wanting something a little different and an out-of-the-way experience, Casa Valerosa is worth paying a little bit more.